* Great horses for beginners and advanced. * One and two hour rides. * Secluded gorgeous beach and lovely wooded trails. * Bi-lingual guides, friendly and helpful. * Slow or fast paced, suited for all riders. * Comfortable western saddles with towels to protect bare legs. * Restaurant, facilities, bathrooms, drinks, shade, etc. * Includes Snack Pack Box: Soda and snack ! ONLY MINUTES FROM YOUR HOTEL. Bus: "Cerritos Juarez" to end of line north. 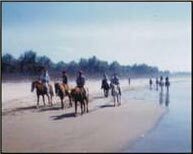 "We had heard Ginger offered the best horseback riding experience in Mazatlan for those who want a small group and NOT on horses that follow nose to tail of the other horses. We found exactly what we were looking for at Ginger's. Rafael is Ginger's husband's son and he led our group. He spoke English and was very personable. I'd recommend this tour to anyone!" Our two daughters, 14 and 16, thought they'd be bored to death on this trip to Mazatlan. Once they did the ride on Ginger's horses they came alive. They loved being on the beach. They loved the horses and the fact they could actually give them commands. This wasn't a watered-down Disneyland version of a horse-back-ride. This was the real thing. Thank you Ginger for making my daughters fall in love with Mazatlan. We try to do a horseback ride wherever we visit, and this was by far the best. 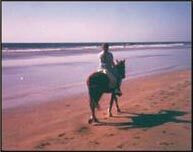 We are experienced riders and Ginger's step-son Noah let us gallop down the beach, which was a big thrill after some of the other "tame" group rides we've been on. I can't say enough about how gorgeous the horses are. They are truly well loved and well cared for by Ginger, Andreas and their family. You want healthy horses? You want happy horses? You want horses that are well cared for and well fed? Then you want Ginger's horses. I asked her for details on why they looked so great. She OWNS her horses instead of renting them from someone else. But it's more than that. She loves them. And that's why her guests get such a great ride! Our family of five gives Ginger and crew an enthusiastic two thumbs up! One of the best things we did while in Mazatlan. And Playa Bruja is one of the most beautiful spots on earth. Be sure to take an hour after the horse ride and enjoy a cold coconut at the restaurant near Ginger's place.